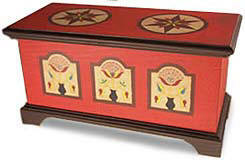 Each of our ten different authentically reproduced chests come in two sizes. 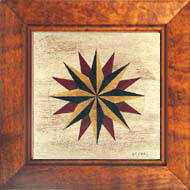 We invite you to learn about where the originals were made, something about the craftsman and their approximate time period in American history. 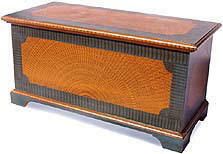 From 1770 to about 1820, Christian Seltzer, his son John, John's brother-in-law and Peter Rank, all built and decorated chests in Jonestown, Dauphin County (now Lebanon County), Pennsylvania. 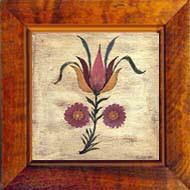 Our replica is an accurately scaled version of a chest built by Christian Seltzer, signed by him and dated 1784. 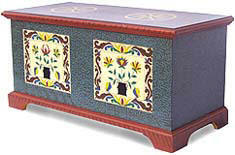 The "Pot and Flowers" motif on this chest is the distinctive decoration found on most of the Jonestown chests, and the obvious inspiration of other decorations in Pennsylvania and beyond. In the 18th and 19th centuries the Shenandoah Valley not only allowed the migration of people but also the migration of ideas. 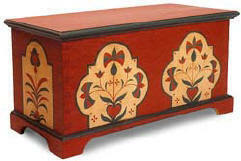 Strongly influenced by the Pennsylvania Germans, the craftsmen of Wythe County, Virginia designed and constructed their version of the painted chest. 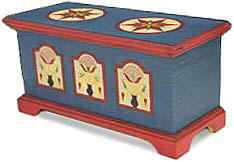 Found in the Lehigh River Valley of Pennsylvania is yet another example of a school of decorated chests built and painted around 1780. 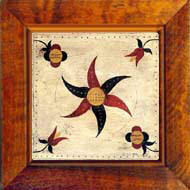 The designs are heavily inscribed with a compass and then painted by hand. 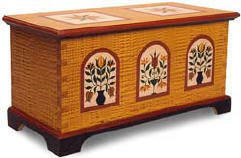 The majority of the original chests found in this area have a common carnation pattern on the front and a cream colored tombstone end panel in which the decoration is painted. 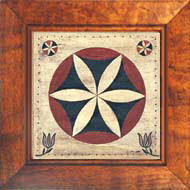 John Seltzer painted and decorated chests around 1800. 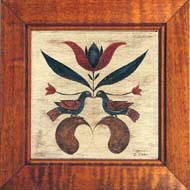 John learned from his father, Christian Seltzer, who was painting chests as early as 1770. 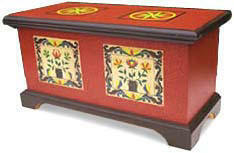 The "Pot and Flower" motif is once again seen on this chest from the Jonestown area. 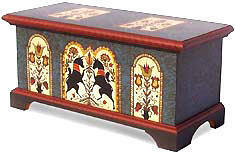 In the Berks County region, the Pennsylvania German chests are distinguished by the frequent use of the confronting unicorns, six lobed flowers and the saw-toothed borders. 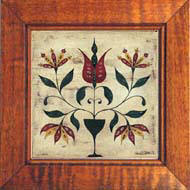 Our traditional Pennsylvania German images will positively charm you. 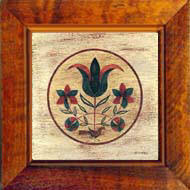 Framed in a custom curly maple frame, their price of $20.00 each makes them our best value and one of our best-selling items. 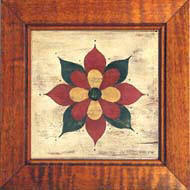 Choose one for a narrow bedroom wall or group several in a kitchen corner. There are 21 prints to choose from. 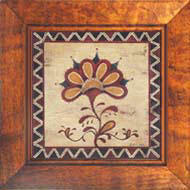 Size: 6 5/8" x 6 5/8"
Click here to go to main Publications page.